Finn the Human, or Finn Mertens, also known as Pen in the original short. He is one of the main protagonists of the well-known Adventure Time series. Adventure Time is an American animated cartoon series created by Pendleton Ward. As is the way of things this amazing story spiced with Finn and Jake’s adventures, quickly went viral. Why? Because it’s really weird, that’s why. It is not surprising if you may be familiar with Finn from Adventure Time. He is one of the greatest fictional figures in the cartoon universe. Finn is from Hub Island which is one of the human-inhabited islands outside of The Land of Ooo. Finn was the only confirmed human and a teenager in the Land of Ooo for a long time. Do you know Jeremy Shada? He is the voice of Finn. Although at times inventive and aggressive, Finn is a kind, brave, selfless, and righteous animated phenomena. His pursuits, to become a hero and the moral sheriff in the Land of Ooo, as he is not afraid to help and protect any innocent person or creature in the universe. Finn is very responsible and becomes upset when he is not able to help others. Due to, being “simple-minded”, Finn often feels confused when it is not clear whether something is good or evil. Out of his heroic nature, Finn is also almost unable to do anything evil and will struggle greatly against doing such things. Finn always care for his friends makes him very protective of them with putting the safety of others above his own. Despite he portrays himself as a tough hero, Finn has a sensitive side that is capable of love and sympathy, as shown by his crush on Princess Bubblegum and his brotherly relationship with Jake. Finn is also able to act like a gentleman when it comes to ladies. Finn believes that real life to be better than anything imaginary, he thinks that imagination is for who can’t handle how rough the reality is. As a courageous warrior and a fearless person, Finn enjoys putting himself in danger simply because he enjoys a challenge. Despite his weak appearance, Finn is quite strong and athletic. He can be seen wrestling and he is able to pick up almost everything around him and run long distances while carrying giant objects. He can jump very high and even make his arms and legs bend in inhuman ways like “spaghetti limbs”. Finn has the ability to mentally fight psychic abilities and he is very tolerant to pain. immunity to electricity as well as electric based attacks. Finn is also skilled in several forms of combat, including hand-to-hand, magic, and swordsmanship. He is quick enough to understand an opponent’s weakness or using his environment to win a fight. Besides combat, Finn displays many other impressive abilities in handicraft such as origami skills. Finn also had a total of five major swords, plus temporary borrowed ones but Finn prefers overpowering his opponents. Finn is a very kind-hearted and likable person. There are multiple times that he shows clear concern for others. 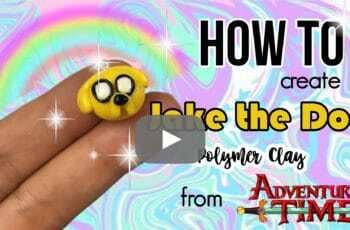 That is why he inspired me to create him as a cute kawaii polymer clay charm.